SINDHUPALCHOWK, Oct 28: Giranchaur of Sindhupalchowk district was completely turned into a pile of rubbles when the catastrophic earthquake struck the country last April. Seeing the utter destruction of the settlement, film artists Sitaram Kattel aka Dhurmus and his wife Kunjana Ghimire 'Suntali' had initiated the construction of integrated settlements with support from the locals. The couple appealed support for their constructions efforts through their Dhurmus-Suntali Foundation. Public backed their noble initiative and donated whatever little they could contribute. As the saying goes, little drops of water make mighty ocean. The small amount of donations of Rs 5, Rs 10, and Rs 50 eventually accumulated to millions of rupees that aided tremendously in the reconstruction efforts. Youths, students, industrialists, artists, employees and even politicians supported the efforts by contributing free labor. Even foreigners joined hands, either through free labor contribution or donations. The initiation led by Dhurmus-Suntali Foundation paid off as the devastated settlement was constructed within six months. 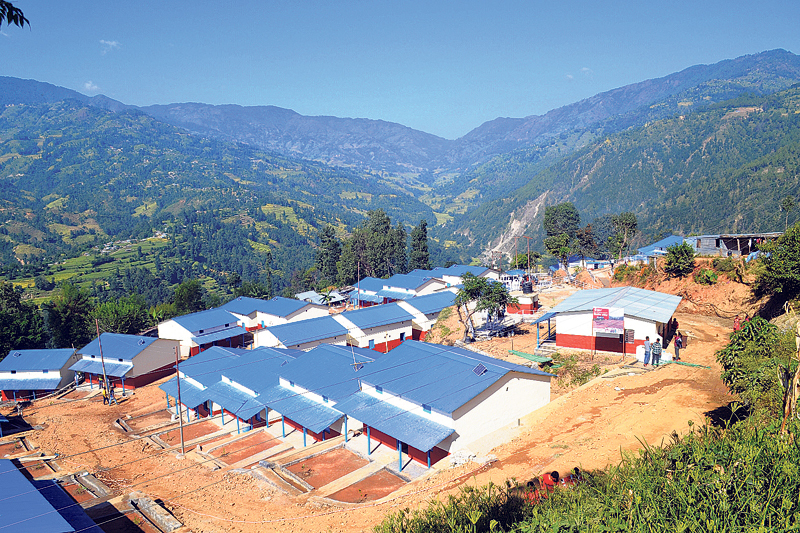 The foundation is preparing to hand over the 67 reconstructed houses to the quake victims on Friday. Most of the victims of the area are from the Tamang community. President Bidya Devi Bhandari will be attending the handover program of Giranchaur settlement of Melamchi Municipality-8. Likewise, popular film artists Madan Krishna Shrestha and Hari Bansha Acharya, popularly known as 'Maha Jodi', will also be attending the function. “This is a campaign to develop our country,” Sitaram, who is preparing to hand over the houses to the locals, told Republica. The cost of reconstruction of this integrated settlement is estimated to be around Rs 500 million, he informed. “A citizen cannot remain mute spectator when the country is going through such a hard time,” he said, adding that more than 5,000 people and organizations have donated to carry out the reconstruction works. Solar panels have been installed in every house and at least two saplings of trees are planted on the premises of the houses. “All houses are earthquake resilient and includes basic facilities such as toilets, separate kitchens, bathrooms, taps among others,” informed Sitaram. The first floor includes store room to keep agricultural products, such as rice, maize, millets, and other grains. The settlement has also facilities of children's park, a vehicle parking space, and two public taps. Similarly, a playground and a public meeting space have also been constructed in the settlement. “We have fulfilled requirements of not only integrated settlement, but also of urban cities as well,” said Sitaram.